The #Living with Climate Change contest is being held as part of the Darwin Plus funded project Climate change adaptation in the fisheries of Anguilla and Montserrat from 2017-2020. 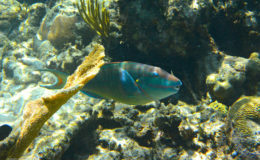 The goal of the project is to mainstream climate change adaptation into fisheries governance and management in Anguilla and Monserrat, using an ecosystem approach to fisheries. The Caribbean Natural Resources Institute is partnering with the Fisheries and Ocean Resources Unit, Ministry of Agriculture, Trade, Lands, Housing and Environment in Montserrat for the contest. Participants will help to document local perspectives on impacts of climate change and priorities for adaptation in the fisheries of Montserrat. They will add to local knowledge and share experiences and stories on impacts of climate change to the fisheries sector and associated livelihoods, and gather ideas and possible solutions and priorities for tackling climate change. The stories shared via videos and photos will be used for awareness raising and mobilising action on climate change in Montserrat’s fisheries. Submissions are invited from fisherfolk and fisherfolk organisations, dive and tour operators, and local community stakeholders (including the general public) with stories to tell on climate change and its impacts on the fisheries sector. Contest participants should be residents of Montserrat and over 16 years of age. Professional photographers and videographers are not eligible to enter. More details about the contest and its rules and conditions are available from CANARI. Applications can be submitted online and via e-mail or Whatsapp (see contest info for contact details). The deadline for submission is January 30, 2019.